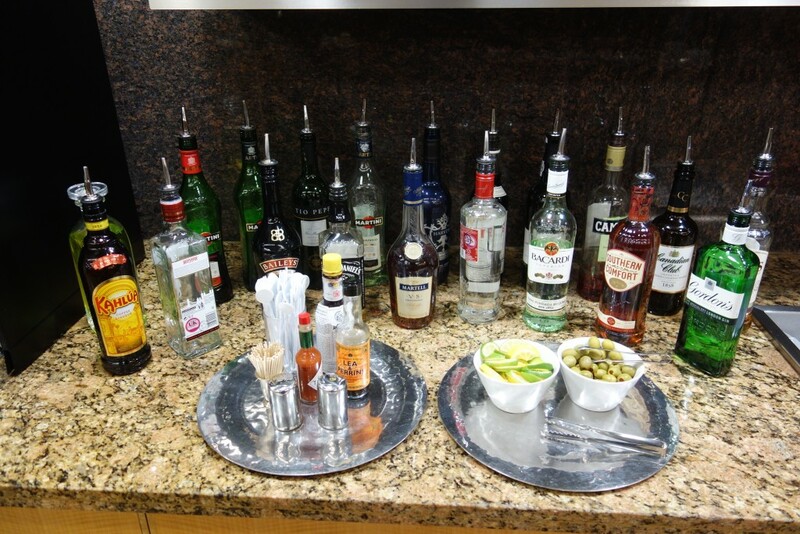 Up next in the reviews of Heathrow Terminal 3 lounges is the American Airlines Flagship Lounge. To save you some time, I don’t know why you would come to this lounge unless for some reason you need really fast wifi. Honestly, I found this lounge depressing after visiting the Cathay Pacific lounge. The lounge looks old and tired and the lighting doesn’t help. It’s a pretty sizable lounge, but there are also a lot more people, so it feels crowded. What I don’t understand is why so many people come to this lounge because having access to this lounge means you also have access to the British Airways and Cathay Pacific lounges. One benefit of this lounge is that you can stare at American planes from the lounge. And I admit, I do enjoy the AA paint job. There’s also plenty of seating and plenty of outlets, and the outlets are American-style, so you don’t need an adapter for your electronics. The wifi is also blazingly fast for an airport lounge (8.5 Mbps down, 5 up), so this lounge could be good for getting work done. I like food, and the food in this lounge just seems more meager and less appealing than the food in either the Cathay or BA lounges. They do have a made-to-order menu, but I happened to arrive when they were switching menus, so I can’t comment on the quality of that food. They also have mini muffins for breakfast, which I did not see in the Cathay lounge. Overall, I found this lounge to be a bit depressing. There’s really not much of a reason to come to this lounge when you have better options so close by. This entry was posted in American, Travel, Trip Reports and tagged airport lounge, american airlines, flagship lounge, lhr, lounge review, travel, trip reports on March 15, 2016 by Edward. I write a lot of trip reports; I read a lot of trip reports. And one of the words that makes me cringe every time I read it is “intuitive”. I blame Lucky for it, as I’m pretty sure his was the first blog where I read someone saying that the seat controls were “intuitive”. I remember reading it and thinking, “that’s a really odd word to use, and it doesn’t really make sense, but whatevs”. But then I kept seeing it again and again and again, both in his blog and in other blogs. If something is “intuitive”, it should be instinctual or true without regards to conscious thought, reasoning, or past experience. Really, when people are using the word “intuitive”, they mean that something is familiar or easy to use. For example, “the seat controls resembled seat controls that I have used in the past, so I didn’t have to think too hard about how to use them”. They probably don’t mean, “if I took someone who has never been in a car/bus/train/plane before and put him in an airplane seat, he would intuit that the seat controls would move the seat in these ways”. I think a large reason why the word “intuitive” now pops up in so many trip reports is because it’s intuitive familiar to the writers and so they don’t have to think about what they actually mean to say. Again, people need to stop and think for themselves. It’s so much easier to regurgitate phrases and memes than it is to think deliberately about what you’re writing, but that contributes to the lack of originality in blogs today. This entry was posted in Musings, Trip Reports and tagged intuitive, musings, rant, trip reports on February 3, 2015 by Edward. I write a lot of trip reports. I mostly write trip reports because I personally find them helpful when I’m preparing for trips, and I enjoy reading well-written, well-photographed reports by other people even if I’m not. I’m not going to lie: it also helps for SEO, and some of my most frequently visited posts over the lifetime of my blog are trip reports. But I’ve been told that some people think of trip reports as easy/filler posts. This is false. You might not like them, but trip reports are some of the most time-consuming posts to write. When I brought up trip reports amongst a group of bloggers at BACon, there were groans and the collective sentiment was that trip reports were helpful for readers but took way too long to do. Think about it: not only do you have to make sure that you’re taking good photos while you’re on the trip, you also have to take good notes so that you can write about the trip coherently and comprehensively at some point in the future. And then the actual write-up can easily take an hour or more when you consider choosing the photos, doing any sort of edits necessary, the writing, and fact-checking to fill in any gaps that you forgot to record. Yes, there are lots of bad trip reports out there. But I am totally forgiving of occasionally bad photos and inane captions (the only reason I usually put captions is because my formatting can get messed up if I don’t include them) because it’s frankly hard. And yes, we don’t need yet another trip report of Cathay Pacific or Lufthansa first class (although the latter will likely become much more rare now that the rest of the United tickets have been flown). But there are tons of products out there that I think are underreviewed, and if you’re not interested in a given product, just don’t read the post. I essentially x out any hotel reviews on my Feedly since they’re almost always irrelevant to me as I very rarely stay in hotels. Summary: don’t read a trip report if you don’t like it, but don’t underestimate the amount of time and effort that goes into a decent trip report. This entry was posted in Musings, Trip Reports and tagged musings, trip reports on November 20, 2014 by Edward. This hotel is one of the few cheap Hilton redemptions after Hilton’s devaluation a couple of years ago. Since it’s a category 2 hotel, it’s only 10k Hilton points per night. In terms of Western hotels in Hanoi attainable using points, there’s also a category 2 Sheraton, a couple of IHG properties, a category 4 Marriott, and the Hilton Hanoi Opera, which is a category 5 (meaning 30k-40k Hilton points per night). While I haven’t stayed at any of the other hotels, I’d happily return to the Hilton Garden Inn as it was a solid choice, particularly with free breakfast via Hilton Gold status. If you’re taking a taxi to the hotel, make sure that the driver understand that you’re going to the Hilton Garden Inn and NOT the Hilton Hanoi Opera. The latter is significantly more well known, so I was glad to have printed out a map that I could give to the driver for directions. I unfortunately don’t have many photos of the hotel itself, so you’ll have to use your imagination. The hotel is pretty new, so things are generally nicely furnished, but it’s also not a full-service hotel, so keep that in mind. The lobby was nice and the staff was friendly, even in the face of rude hotel guests (one guy was very angry that there weren’t any bellhops to help him with his bags). The elevators weren’t air-conditioned, which I have found to be a relatively common complaint that I have in Asia. Breakfast was surprisingly good for a not-full-service hotel. I thoroughly enjoyed the food–it wasn’t fancy or as extensive as Asian hotel breakfasts can be, but the food was solid and the pho was tasty. The service at breakfast could honestly rival first class on airlines and Michelin-starred restaurants. The servers were incredibly gracious, they were willing to fetch whatever you asked for, and they did that ninja thing that they do on Singapore such that your plates got cleared immediately upon you getting up without you noticing. It perhaps helped that I was there very early, so it wasn’t very crowded, but they were very eager to please and provide good service. The room was perfectly comfortable and serviceable. My only small gripes were the design of the bathtub and the light switches. Essentially, because of the design of the bathroom, you’re going to get water on the floor when you shower. We thought that there was a leak in the tub, but when we called to get someone to come take a look, they acknowledged that the tub was poorly designed. And with the light switches, there was one light switch hidden behind a pillow that took us 15 minutes to find. Overall, I’d happily stay at this hotel again. No, it’s not a Park Hyatt, but it’s a solid hotel with great service and tasty breakfast. And it’s one of the few affordable points redemptions left for Hilton. This entry was posted in Hilton, Hotel Reviews, Travel, Trip Reports and tagged hanoi, hilton, hilton garden inn hanoi, hotel reviews, travel, trip reports on November 19, 2014 by Edward.